Decluttering and organizing go hand in hand. I recall as a teenager cleaning out my closet. First, I would bring out all of my clothes, get rid of the ones I no longer had use for, and then organize. Then, I would sort by fabric, length, and color. It was like a puzzle to me. Essentially, I dumped the puzzle pieces on the floor, sorted, then figured out how it all fit together. Similarly, in Marie Kondo’s book “The Life-Changing Magic of Tidying Up” she takes readers through the same basic process…she just has a lot more thought, logic, and intention to her method than my teenage brain did! Read on to learn her world-renown principles to minimalist storage. First things first, before you can organize or store your items, you must first discard. The KonMari method has a very specific approach to discarding things and much of it has to do with what brings you joy. You can read more about it here. Once you go through the discarding process, the next step is to store your things. The order of these two steps is critical! 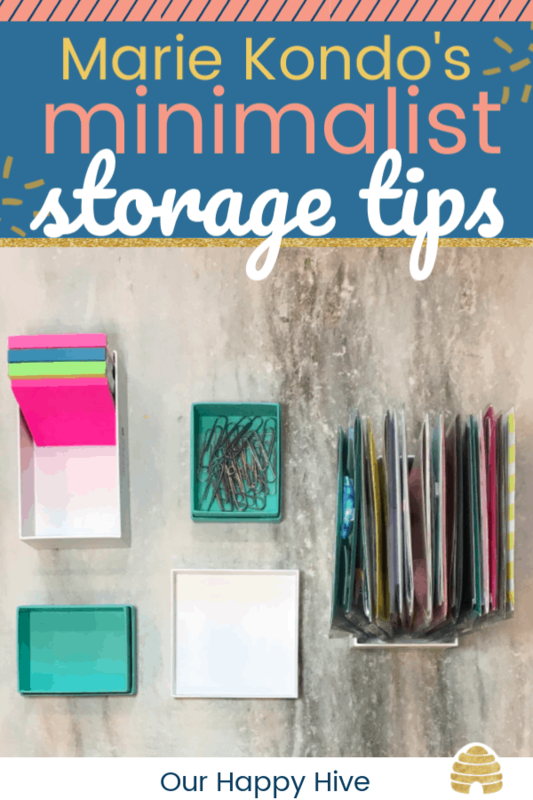 By discarding first, you will have less to store, more space to work with, the job itself will be more manageable, and you will be far more likely to keep it organized once you’re finished! Isn’t that what we all want?!? Now, this is key! You need to make sure that every single item you own has a place…their specific home in your home. You only need to do this once. If you skip this step or don’t do it completely, clutter will creep back into your space! Kondo is all about keeping storage simple and practical. The more complex, the less likely you are to maintain. She encourages that you don’t need to store by season or frequency of use etc. Keep it as simple as possible. This increases the likelihood and ability to maintain! The KonMarie method asserts two primary rules for storage. Everyone in your family should have a designated place to store their things. Ideally, it will not be in multiple areas of the home, but a singular place. For example, instead of having toys in the basement, in the living room, and in their bedroom, all of a child’s toys should be stored in their designated place, most likely their bedroom or closet. Kondo believes that this gives each person a sense of belonging and ownership in the home and makes them tidy homemakers. You want to be able to visually tell at a glance how much you have and where everything goes. 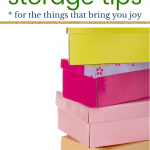 Kondo mentions this several times throughout the book including when she talks about storing things vertically, storing seasonal clothes, and storing things centrally. Her rationale is that, if we can’t see it all at once, we likely won’t remember what we have and we’ll be more likely to buy duplicates. Let’s talk a little more about vertical storage. Marie Kondo is the queen of vertical storing. She mastered the art of folding and storing clothes vertically in drawers. She encourages clients to avoid piles and go vertical wherever possible. She gives examples of papers, stationery, scrolled towels, and even carrots in the refrigerator. As a true minimalist, Kondo advocates re-using boxes. Her favorites are shoeboxes. She also mentions that Apple product boxes and extra plastic food containers are great to store things in. 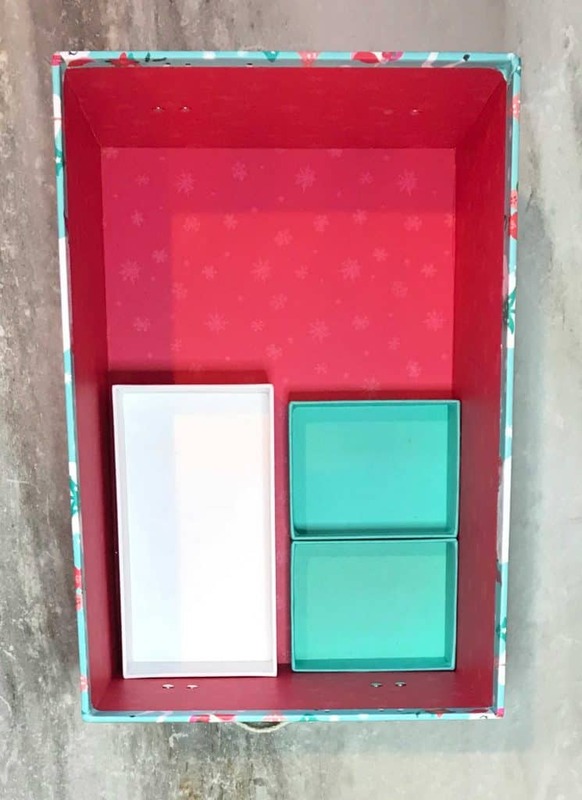 You can use boxes to compartmentalize drawers or place on a shelf. It’s something you’ll need to experiment with to find the right combination for your particular space. I had fun thinking about what little items I was now going to store in a couple of beautiful turquoise boxes from Tiffany that I had kept empty for years. Marie shares five criteria for the ideal storage container. Kondo does use a few commercial storage products, but she recommends her clients complete the entire discarding and storage process and then look for the storage hardware they really want. Kondo recommends storing handbags inside of each other. Instead of placing handbags full of tissue paper to keep their shape, sort your handbags by material e.g. sturdy leather, canvas etc. and pack “like” materials inside each other. No more than two handbags inside of one larger handbag. Make sure the straps are visible so that you can quickly recall what’s on the inside. Personally, I don’t have a large number of handbags, but I can see how this would save significant shelf space. I have a hard time envisioning how one or two bags would fit neatly inside another. Maybe that’s because most of my bags are similar sizes. 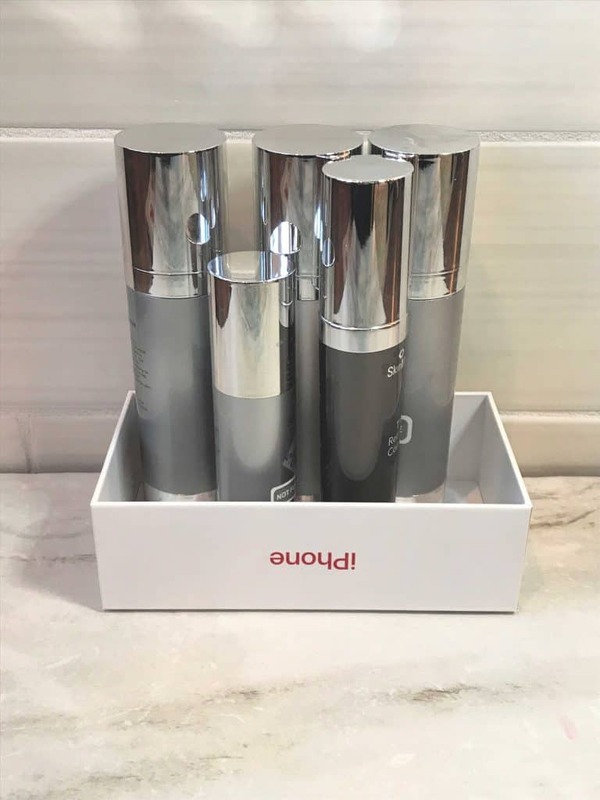 Marie shares her routine when she enters the door at the end of the day and unpacks her bag. She literally encourages her clients to take every single thing out of their bag every single day. She says the whole process only takes 5 minutes. Her theory is that this helps to prevent clutter like old receipts, tissues, or cosmetics being left in the bag. Kondo shares that this helps prevent things from getting trapped in bags that you don’t find until you use the bag again at a later date. Remember, the first tip in this list. It’s important that you designated in advance a place for every item that’s in your bag. The KonMari Method recommends storing as many things as possible in the closet. She shares a lot about how things can fit in a traditional Japanese closet. While I won’t go into that level of detail, she does recommend the following items be stored in the closet. Off-season items like seasonal ornaments, seasonal sportswear, photo albums, regular cloths, bedding, electrical appliances, space heaters, fans, suitcases, golf clubs, and guitars. While this seems like a lot for a closet, she reminds us that due to the extensive discarding process, clients usually have room for all of these items when it comes time to organize their storage. As a minimalist, Mari Kondo focuses heavily on discarding, but she also has strong beliefs about storage. She wants people to keep the things that bring joy and to store them in a simple and intuitive way. Optimizing space by storing things vertically, using a practical storage process, and storing in a way where you can visually see your entire collection of any category are cornerstones to her method. 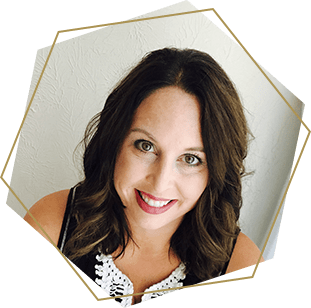 At the end of the day, the bottom line of her book “The Life-Changing Magic of Tidying Up” is to have people focus on the things that bring them joy in a way that is easy to maintain and manage.